The Jin Duo appeared on Show 273, recorded in June 2013. 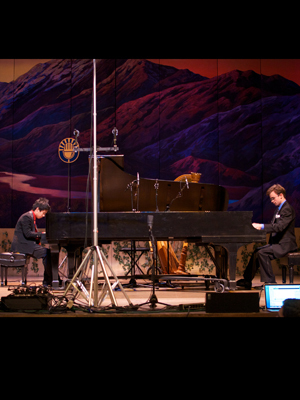 The Jin Duo is a piano duo based at Idyllwild Arts Academy inÊIdyllwild-Pine Cove, California. The pianists are coached by Nelms McElvain. The duoÕs members are 17-year-old Julian Jenson from Hemet, California and 17-year-old Vuthithorn Chinthammit from Bangkok, Thailand.